RVC-CAL: A constrained set of a dataflow programming language called CAL (Caltrop Actor Language), used for modeling FUs (i.e., video coding tools). FNL: FU Network Language, used for describing connections of RVC-CAL FUs. RVC-BSDL: A constrained set of BSDL (Bitstream Syntax Description Language), used for describing the syntax of the bitstream. 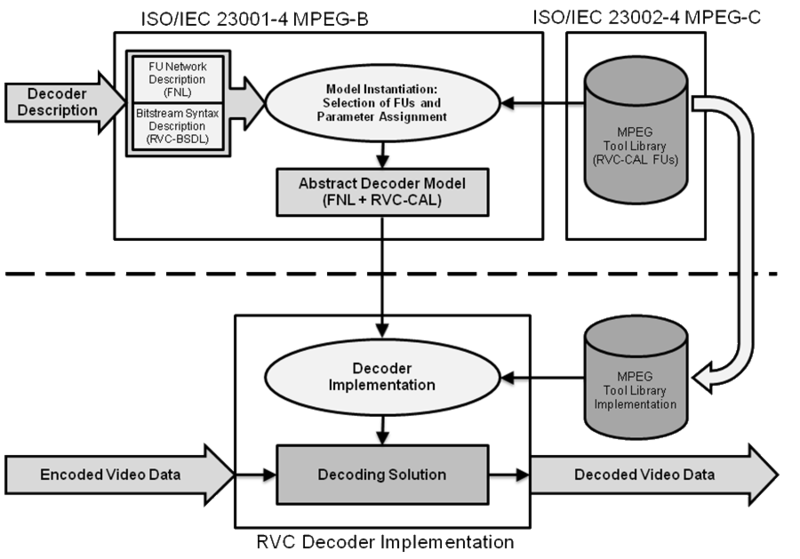 A VTL (video tool library) is standardized to offer FUs that can be connected to form networks of video codecs. The reference software of VTL is written in RVC-CAL and the FU network is described in FNL. The bitstream parser can be automatically synthesized from BSD (Bitstream Syntax Description) written as a RVC-BSDL schema. Proprietary implementations of VTL and the bitstream parser can also be written in any other programming languages, as long as they behave in the same way as the reference software. A more detailed description of the RVC decoder is illustrated in the following figure (Figure 2 of ISO/IEC 23001-4). Only one revision exists, which was created (or modified) by hooklee at Sunday, June 19, 2016 11:17:37 PM.